All videos of The-Dream is in high quality music video VOB format. The-Dream - Best videos. Download in original DVD-quality VOB format. 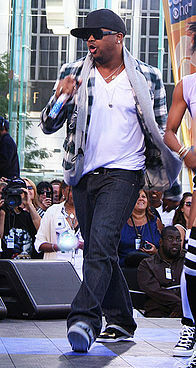 Terius Youngdell Nash (born September 20, 1977), better known by his stage name The-Dream, is an American R&B and pop record producer, singer, and songwriter. He is known for co-writing many successful songs, including "Me Against the Music" (2003) for Britney Spears, "Umbrella" (2007) for Rihanna, "Single Ladies (Put a Ring on It)" (2008) for Beyoncé and "Baby" (2010) for Justin Bieber, as well as for his acclaimed releases as a solo artist. Screenplay VJ-Pro Hits Vision February 2011 ... and etc.